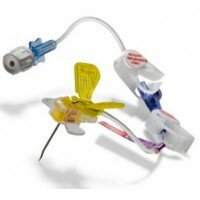 The PowerLoc Safety Infusion Set Family is designed with both the clinician and the patient in mind. The product is indicated for the administration of fluids, drugs and blood sampling via a surgically implanted vascular port. The PowerLoc Safety Infusion Set Family is the ideal device for accessing PowerPort devices. This power-combo enables contrast agents to be power-injected. As a result, tissues show up more clearly in CECT scans, making it easier to monitor patient condition. 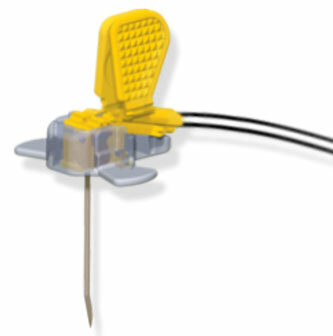 The PowerLoc Safety Infusion Set's low profile and small footprint and design make it an ideal needle for dressing the access site. The small size of the needle and the downward angle of the tubing coming off of the back of the device help to maintain dressing integrity. Power injection capability enables imaging. MiniLoc SIS + Power Injection Capability = PowerLoc SIS. Small design facilitates ease of dressing. As the needle is removed from the port and enters the base of the needle, an orange safety shield rotates over the needle point and the needle locks into place. A tactile feel, an audible click and visual confirmation verifies the lockout for safe removal, transporting and disposal of the PowerLoc needle. Low profile and small footprint enable the site to be easily dressed. Downward angled tubing to help maintain dressing integrity. Ergonomic wing design provides controlled access and site visibility. Audible "click" and visual indication of lockout. 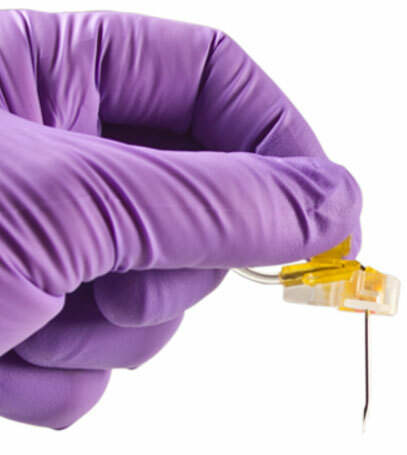 Dual lumen port adaptable to enable simultaneous infusions through dual lumen ports. Safety feature conforms to current user technique. Safety feature covers needlepoint to reduce risk of injury and exposure to bloodborne pathogens. 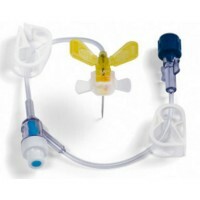 The PowerLoc Safety Infusion Set Family of devices is intended for use in the administration of fluids and drugs, as well as blood sampling through surgically implanted vascular ports. 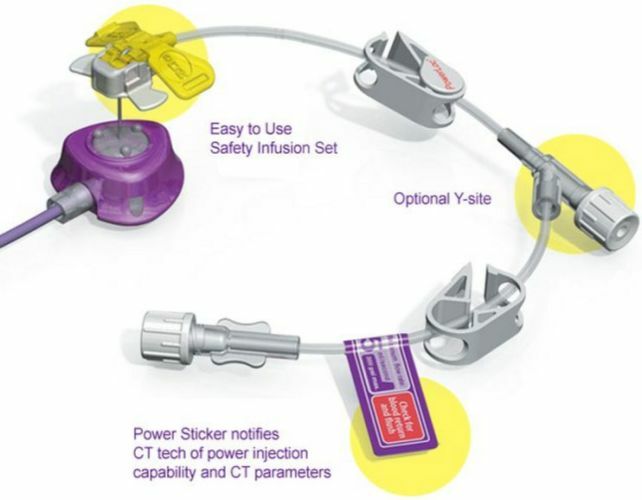 The PowerLoc Safety Infusion Set Family of devices are also indicated for power injection of contrast media into the central venous system only with an implanted port that is also indicated for power injection. The maximum recommended infusion rate at 11.8 cPs is 5 mL/second for 19 G needles, 5 mL/second for 20 G needles, and 2 mL/second for 22 G needles. DO NOT USE, if the presence of a device related infection, bacteria, or septicemia is known or suspected. DO NOT USE, if local tissue factors will prevent proper device stabilization and/or access. Fully tighten all connections, Y-site end caps, or needleless connectors before use. Failure to attach an end cap or appropriate needleless device after removing a male Luer locking end cap or needleless connector can result in an embolism or bleeding. Intended for Single Use. DO NOT REUSE. Reuse and/or repackaging may create a risk of patient or user infection, compromise the structural integrity and/or essential material and design characteristics of the device, which may lead to device failure, and/or lead to injury, illness or death of the patient. Failure to use the safety mechanism of the device correctly, when removing needle from port site could result in needle tip re-emerging from the base, resulting in an accidental needlestick with a contaminated needle. A needlestick with a contaminated needle may cause infectious disease. Verify needle length is correct based on port reservoir depth, tissue thickness and the thickness of any dressing beneath the bend of the needle; if too long, needle and/or port may be damaged at insertion; if too short, needle may not completely pierce port septum, and medication may be delivered into surrounding tissue and/or needle may be blocked. Do not alter the device.